Location an d Design Hydraulic Studies (DHS) are required by 23 CFR §650 for bridge projects using federal and state funds. The requirement was established in response to the high number of bridges being damaged or destroyed as a result of floods and erosion. At the time the legislation was passed, and likely still the case today, more bridges are damaged or destroyed in the United States as a result of floods and erosion than all other causes combined. 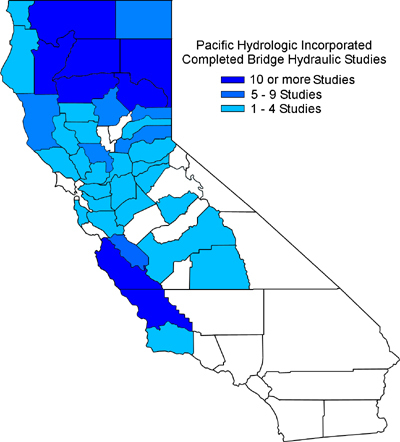 Even if not using federal or state funds, bridge hydraulic studies are often required for local agency and private bridges to meet the standard of care established by federal and state agencies. PHI has conducted hydraulic analyses of well over 250 bridges with over 150 of these being completed Design Hydraulic Studies with DHS reports. Bridge hydraulic analyses other than DHS were conducted for feasibility studies, seismic retrofit studies, flood studies, flood damage studies, and for other purposes. Prior to replacement the Franklin-Thornton Boulevard Bridge consisted of a 2073.5-foot composite structure including a two span steel truss structure with six concrete approach spans over the Mokelumne River continued over the floodplain to the north with a long timber trestle causeway containing numerous short spans. The preferred replacement structure consisted of a three span concrete beam bridge over the Mokelumne River and a 31 span reinforced concrete slab bridge over the floodplain to the north. The bridge is located immediately downstream of the confluence with the Cosumnes River, the site is subject to tidal influence, and properties adjacent to the Mokelumne River are protected by a levee. Further adding to hydraulic complexity at the site, an access road intersects the trestle within the structure on an earth approach and the floodplain spanned by the trestle is a valuable wetland environment. Given the tidal influence, water surface elevations of equiprobable flood events at the site will vary based on the tide and storm surge present at the time of peak flood flow. Design floods for the replacement bridge were determined considering the historic combination of riverine flood events combined with concurrent conditions of tide and storm surge. Being located adjacent to a levee, against which any increase in flood water surface elevation represents an increased risk of levee failure, the replacement bridge had to be designed in a manner that did not increase water surface elevations during flood events. Additionally, in order to avoid impacts to the wetland environment and to avoid potential changes in channel morphologic conditions, the division of flows between the river channel and the floodplain had to be maintained, an objective complicated by the fact that many timber trestle pier bents were being replaced by far fewer concrete piers of similar size. Given these constraints the flood hydraulic analysis was conducted to identify the appropriate width of the earth access road approach to the replacement structure such that hydraulic conditions in the Mokelumne River and floodplain match the existing conditions. Flood hydraulic analysis to identify the water surface elevations for these floods, determine potential project impacts, and determine potential mitigation measures to avoid flood impacts if necessary. Occasional requirements of other federal, state, and local agencies.